Mount Everest has captivated intrepid men and women since the 1920s. The exploits of legends such as George Mallory, Sir Edmund Hillary and Tenzing Norgay put the mighty mountain on the map. Today we offer a wonderful lodge to lodge Everest trek taking in the very best of this region. First we trek along the busy Everest Base Camp Trail, alongside other hikers, local Sherpas, yaks and mules. Then off the main trail to explore the quiet countryside through farmland and charming villages as we ascend each day. 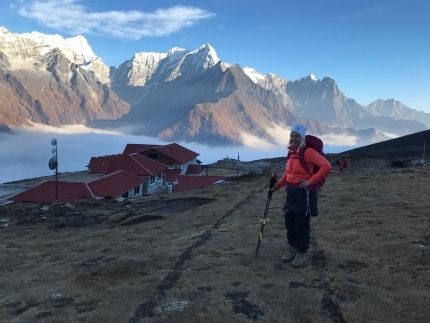 Finally, we end up on a secluded trail up to our last lodge where we will see spectacular views of Mount Everest. Aside from breathtaking scenery, travellers to the region can experience unique Sherpa culture by visiting monasteries and museums along the way. Days are filled with walking for the sheer pleasure of it, past colourful prayer wheels and across swing bridges straight out of an Indiana Jones movie, while evenings are rewarded with hot food and conversation with like-minded people around the dining-room fire. Now it is possible to trek in the Khumbu region staying at comfortable lodges with all the modern conveniences. Our luxury lodges all offer spacious rooms which are pleasantly decorated and have attached bathrooms with running hot and cold water. The best feature of this trip is to be able to sleep in comfortable bed, take a hot shower and even enjoy a glass of wine with your dinner. The heady mix of natural beauty, fascinating culture and a personal sense of achievement, as well as warm Nepalese hospitality from the people, makes the Everest trek one of the world’s most unforgettable journeys.